KHV or Koi Herpes Virus is a potentially deadly virus which has recently shown up in the Koi industry. The first outbreak was reported and confirmed in late 1998, early 1999 in Israel. Since then, outbreaks have been reported all over the world, in Asia, Europe, and The United States of America. As with the majority of Herpes type viruses in the world, Koi Herpes Virus is believed to remain with infected fish for their full lifespan. Even Koi that was exposed to the virus at one point or another are considered carriers, even if they did not show signs of the virus. 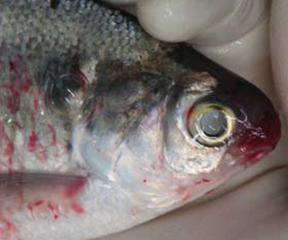 The mortality rate for fish exposed to the virus ranges from 60 to 80 percent. When it comes down to it, any Koi is susceptible to the virus. The only real way to prevent it is to make sure that your Koi is never exposed to it. As long as you are knowledgeable about the disease, the chances of your Koi catching Koi Herpes Virus is substantially less. Since the first outbreak in 1998, quite a bit has been learned about the virus. Knowing the facts about the virus may mean the difference between potentially infecting your pond, and preventing it. Once a fish has been exposed to the virus, it will always be a carrier. Even with proper treatment, these fish will never be able to go to a new home. Sending exposed fish to a new home can potentially spread the virus to other fish. Likewise, adding new Koi into your pond could cause the new fish to get the virus, and cause a potentially higher mortality rate. There is no known cure for Koi Herpes Virus. Stress does not cause the disease in any way. However, stress can cause the disease to have a higher mortality rate. 74 degrees Fahrenheit activates the disease. This is extremely useful information because it allows for quarantining and testing to see whether or not fish have Koi Herpes Virus. The virus can be spread a number of ways, including coming into contact with infected fish, water in which infected fish swam in, tools used when handling infected fish, and so on. Once your fish have been diagnosed with Koi Herpes Virus, the only real way to ensure that you do not infect any other fish is to consider depopulation. Depopulation is essentially the elimination of your entire population of Koi. While this might seem harsh, it is truly the only way to completely eliminate the possibility of any other fish from catching the virus. When purchasing new fish, it is a good idea to quarantine the new fish separately from your current population for no less then 15 days. Knowing that the disease is activated at exactly 74 degrees Fahrenheit allows you to expose your fish to the right conditions for the disease to show itself. Koi that live in the conditions for this amount of time and do not develop any symptoms will have a substantially less chance of having the virus. It is important to remember that when you quarantine your new Koi, they should remain under total isolation. This means that you should not allow anything to come into contact with the quarantined Koi, especially items that also come into contact with your current population. Separate tools, food, and water should be used, and never under any circumstances, should the tools used for your quarantined fish leave the area in which they are used. Another important thing to remember is proper hand washing procedures when handling both Koi and Koi items within the same time period.